a packed day, rebuild clean os faultless.^worked by croak of crows. still felt weak within me. in office listening radio after posted tweet. attending download lately after checked latest postings. near 3pm launched to rebuild ready os, fixed problem from previous backup. the monitor stayed there till 6pm. i narrowly finished backup after 7pm. dined with noodle&pies. its snowing when i left the office. Masheng, kill dirty&let my works today rewarding, ie. a real working&secure os against frequent hacking from China surveillance. baby's mom, emakingir buzzed in via gmail in late afternoon, discussed my next visit. baby son today first day join his kindergarten since his mom's winter vacation. she also told me her os likely infected. my os also likely infected this afternoon. God, i trust my works online with u, trust holy message&valuable history of my Empire in moulding with u. let the pure white tonight covers the corpse of spies&surveillance. read on bed till near 11pm. 5th snow in lunar 2010.^ema cooked my porridge, left to her school before i got up. the grandma also arrived to care baby son. i held baby son on my shoulders and asked if he want to keep my camera&notebook, he only accept my cellphone. so i felt i would like to resume to live single now that i stepped into growing my Royal, after last night melting love&pardon for baby's mom, emakingir. then i update baby's desktop's game list, tried some with baby son. but 2 games i looked upon failed me. kissingg baby&left to QRRS office. the small snow still drifting, so auspicious. Masheng, i know ur love upon me, upon my baby son, upon my cared. u kill dirt again, but also bring my girls, esp. my girl zhou, my 3rd wife, into my new life. posted tweets, then read. refined family google profiles, adding sidewiki. office evil heavily bit. chatted with baby's mom, emakingir, online, arranged next visit in which i will shower&rent her additional cheap cellphone. sorted stuff newly got before lefe to dorm. in dorm review love between baby&me, his sainity&gifted power. it turns bright sunny in afternoon. Masheng, these days i was reminded my 3rd son, with my Taiwan girl with who in my life so far met only twice. 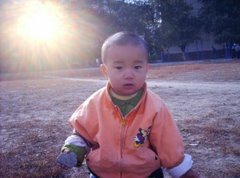 when baby still doesn't learn to speak, i talked him i want the girl exactly he, my baby son, arranged to meet up when i carried him haunting near his mom's house, back to 2006 or so, without glasses. in holy message i assure she from Taiwan, and our marriage forged by my baby son. she is the brightest girl in my wives, her perfect figure, and independent attitude admired in our first time, when baby son let me following her into a Taiwan feature snack shop near baby's mom's house, and in the occasion she yet didn't let me see her face, by standing with back to us. that's our first sight. God, Masheng, i will never afford to miss her in my life, for the moment i felt so satisfied by her. Ok, its a nice day, i know from the start u testifies ur saint deed in front me. dear, my dear Sun, pl sooner join me, and let my girls come to me sooner. i need a new life, u know. in office refined some family posterous accounts, adding new group profiles, adding more group members from family to streamline posting to blocked sites within China, esp video&photo hosting sites, like youtube, vimeo, flick, picasaweb, etc. finished it till 7pm. sorted portable suite. asked baby's mom, emakingir, if want to chat, she refute, so left to dine. in dorm felt its a important moment for my family, and want to talk with baby&his mom. but gave up by picking blogging. God, let me grows, and so does my Royal of China.